When Stephanie Baber attended Open Day at Monash Peninsula she “instantly admired the campus culture” and enrolled in the Bachelor of Physiotherapy not long after. “Looking back, I realise that having all allied health and nursing degrees on the same campus fostered respect for every discipline among us students, which I’m sure has transcended through to the workplace”, Stephanie reflects. 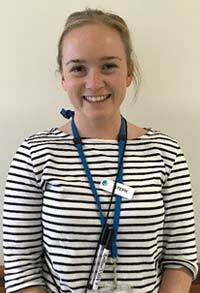 Megan chose to study Physiotherapy due to a personal experience when visiting her Nanna at a rehabilitation hospital after she had had a total hip replacement. "As soon as the Physio entered the room, my Nanna’s mood immediately improved, and she responded so well to this young, enthusiastic and kind Physiotherapist. The Physio explained how she was going to take my Nanna for a walk, for some exercises in the pool and ultimately get her back to feeling herself. The joy I sensed in my Nanna from this interaction made me realize immediately that I knew Physiotherapy was the profession for me." Megan chose to study at Monash due to its small class sizes, new facilities, and evidenced based course design. The course had also been recommended to her from a friend who was half way through the course, and couldn’t speak more highly of the structure and the staff. This degree allowed Megan to travel overseas, develop lifelong friendships, enhance and develop great communication skills, and led her to a full time position before she had even graduated in her fourth and final year. Megan felt incredibly well supported, encouraged to strive for excellence, and ultimately graduated as a confident and enthusiastic health professional. The highlight of Megan’s studies was the positive learning experiences whilst she was on placement at Monash Medical Centre, the Royal Children’s’ Hospital and Warragul Hospital, during her third and fourth years. "The hospital placements that are offered to Monash Physiotherapy students studying in Melbourne are of an extremely high standard and they offer a huge variety of experiences." 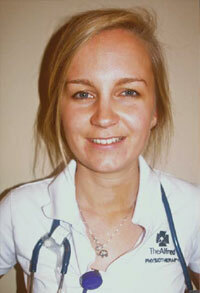 Megan is currently employed as a Grade Two Physiotherapist at Epworth Hospital. She started in the rotating graduate program, and this provided the opportunity to gain experience across acute cardio-respiratory, general surgical, supervised work in ICU, acute orthopaedic inpatients, private orthopaedic inpatient rehabilitation, hydrotherapy, acute Medical/Oncology, neurology, mixed outpatient caseload, and acquired brain injury. Megan believes that this profession is beyond rewarding. "I am never looking at my watch counting down the hours until the end of the day, and can say with sincerity that I thoroughly enjoy being at work. Its appears to be simply a bonus that I happen to earn an income for helping people return to their everyday lives after they have become unwell, had an accident, or sustained an injury as the job satisfaction is exceptionally high." 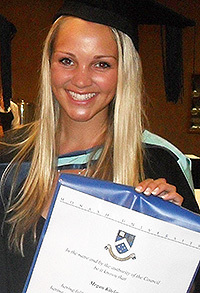 Tori Everard graduated from the Bachelor of Physiotherapy degree in 2009 and is currently working at the Alfred Hospital as a rotating Grade 1 Physiotherapist. "After finishing Uni I knew I wanted to work in a public hospital. I get to practice in a wide variety of acute settings. So far I have worked in the respiratory unit mainly treating patients with cystic fibrosis, lung transplants and COPD. This has enabled me to gain valuable experience across a wide range of respiratory diseases." says Tori. Tori says she really enjoyed her time at Monash, making some amazing friends, who she feels will have for life. "The lecturers were all so wonderful and so supportive of us. They were always happy to help out or just have a chat about any problems we had." Students of the Physiotherapy course are taught by highly skilled Physiotherapists, transferring their expertise and wide range of experiences on to future graduates. The Physiotherapy degree incorporates extensive clinical placement of which Tori mentions were extremely valuable and she especially enjoyed the acute hospital placements. "I was really lucky to undertake electives in Movement Disorders and Intensive Care too" says Tori. Her most treasured experience so far has been working with patients with cystic fibrosis. "What an inspiring group of people." Tori is looking forward to going back to University in the near future to do some postgraduate study. Bonnie Dreher, a physiotherapist at the Mornington Centre, was in her early teens when she decided upon her future career. "I played basketball and netball and saw physios a lot because I had a few injuries, and that was when I became interested in physiotherapy." One of the first graduates of the Bachelor of Physiotherapy, which commenced at Monash in 2005, Bonnie says "We had a great group of about 60 and the lecturers and tutors were fantastic." Physiotherapy students mainly work in small groups. The core areas of education, musculoskeletal, cardiorespiratory and neurological physiotherapy are taught by experienced and highly skilled physiotherapists. Clinical placements play a large part in the course, and the final 18 months are primarily in clinical education, which is taken at clinics, hospitals and other sites managed by clinical partners. After graduation, a number of Bonnie’s classmates went into private practice but she chose to join Peninsula Health to gain broader experience. 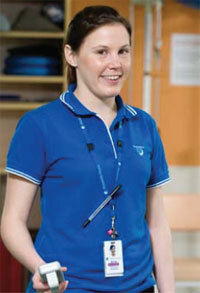 "At the moment I’m mainly involved in aged care physiotherapy. I’m a rotating Grade 1 physiotherapist, so I have the opportunity to see a range of different physiotherapy needs, in fourmonth block placements. Peninsula Health employs about 20 Grade 1 physios, and I’ve already seen patients with chest problems, neurological problems, and those who have had orthopaedic surgery." "I’m very interested in paediatrics, which is where I’d like to end up working – with the kids! I did a paediatric placement at SCOPE, a public sector disabilities service, and I really liked it." Bonnie keeps fit playing indoor netball and is looking forward to a holiday in Perth with her partner, Nick, who is also a physiotherapist. Bonnie and Nick met in the first year of their physiotherapy course and have been together ever since, both happy to be working in their chosen profession.